DATA was an electronic music group created by GEORG KAJANUS (ECLECTION, SAILOR, NOIR) in the late ’70s after the breakup of Sailor. Georg decided to experiment with electronic music and formed DATA with vocalists Frankie and Phil Boulter. One reviewer aptly said “Blending Italo-disc, Giorgio Moroder, ABBA and telex influences, DATA befriended synthetic experimentation with melodic pop sensibility to great effect”. 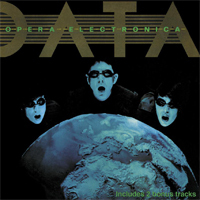 The classically orientated title track of DATA’s first album released in 1981 was used as the theme music to the film “Towers Of Babel” which was nominated for a BAFTA award in 1982 and won the Silver Hugo Award for best short film at The Chicago International Film Festival the same year. Georg has digitally remastered the original album adding two bonus tracks. ...repetitive patterns rarely produce a groove but they perfectly convey the period's stifling atmosphere, its madness captured in the well-concealed rock 'n' roll of "Cuckooland" whose deadpan vocal theatrics and electronica-stricken beats point to the ultimate blackness...In this context, "I Want To Know" sounds more like demand rather than inquiry, and the belligerent, if flat, "Fallout" would be the only possible answer to such a statement - lightened by a lucid, lysergic even, middle section that leads into "Fever Of Love" where a swirl is truly infectious. It can serve as an entrance to the DATA world - unwelcoming and arresting at the same time. Many of these tracks sound like they could easily be twenty-first century hits. The persistent beats and instantly catchy vocal melodies should appeal to a wide range of listeners. The music has been compared to Abba and Giorgio Moroder, both of whom should give you a good idea of what this music sounds like...Strange how current and relevant these songs sound in 2018 (!). The sound of DATA exudes joy and liveliness (sometimes even hyperkinetic) more than the then current sterile new wave. Daring, headstrong and perhaps even too accessible because of a hidden urge to score that one big hit. Although, the theatrical 'Life On Video' and the nice 'Armageddon' enforces respect. The film industry also liked it and used the title track for the movie 'Towers Of Babel'. ...with "Armageddon" a prime example of how to deal with tough issues in a cleverly flippant style and the opera based title track illustrating just how daring Data were attempting to be, there's still a lot to admire. The latter blending styles in a way that maybe isn't so readily illustrated elsewhere...For fans of Kajanus's wide and hugely varied catalogue, this reissue will be most welcome, while for followers of burgeoning electronica, there will also be rewards aplenty.